In 2013 I was asked by CBK Groningen and the Tschumipavilion* to come up with an educational program. The initial working title for the project was “wil jij misschien mijn Tschumipaviljoen even zien”. Referring to an old traditional dutch song about a child exited about designing and showing his ‘Peep show box’ to the world. 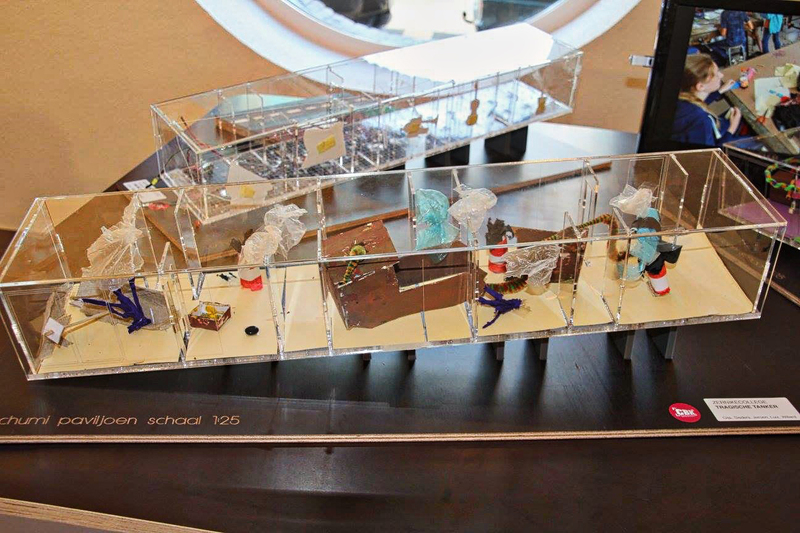 A scaled down (1:25) plexiglass maquette (by Op Maat), makes it possible for kids to think of and realize their own concepts for the pavilion. Over 300 inspired students have allready done so. The input is truly remarkable. In a lot of cases the concepts can compete with that of the established artists that have already been invited to fill the actual pavilion. *The tilting Glass Video Gallery was completed by French-Swiss architect Bernard Tschumi in 1990 as part of an outdoor exhibition in the north Netherlands city of Groningen and is now used as an exhibition pavilion for kinetic and interactive art projects.